↑ "Olympics 2020: Tokyo wins climbing". ↑ "2020 Olympics Vote Total Box". Associated Press. Miami Herald. 7 กันยายน พ.ศ. 2556. สืบค้นเมื่อ 8 กันยายน พ.ศ. 2556. ↑ "羽田・成田発着を拡大、五輪へインフラ整備急ぐ". 日本経済新聞. 10 กันยายน พ.ศ. 2556. สืบค้นเมื่อ 10 กันยายน พ.ศ. 2556. ↑ "五輪で東京に1000万人　過密都市ゆえの課題多く". 日本経済新聞. 10 กันยายน พ.ศ. 2556. สืบค้นเมื่อ 10 กันยายน พ.ศ. 2556. ↑ PST (24 มกราคม พ.ศ. 2557). "Mori heads Tokyo 2020 organizing committee". Sports.yahoo.com. สืบค้นเมื่อ 4 กุมภาพันธ์ พ.ศ. 2557. ↑ "Toshiaki Endo appointed Olympics minister". The Japan Times. ↑ "Super Bowl Ads; Japan National Stadium Upgrade; Contador Banned". ↑ Himmer, Alastair (17 กรกฎาคม พ.ศ. 2558). "Japan rips up 2020 Olympic stadium plans to start anew". news.yahoo.com. AFP. สืบค้นเมื่อ 17 กรกฎาคม พ.ศ. 2558. ↑ "Tokyo 2020 candidature file – section 8 – Sports and Venues" (PDF). Tokyo 2020. สืบค้นเมื่อ 10 กันยายน พ.ศ. 2556. ↑ "Tokyo panel: Olympic cost could expand fourfold". NHK. 29 กันยายน พ.ศ. 2559. สืบค้นเมื่อ 30 กันยายน พ.ศ. 2559. ↑ Originally to be held at Water Polo Arena in Koto, Tokyo; venue moved in June 2015. "東京五輪、26競技の会場決定　自転車・サッカー除き". Nihon Keizai Shimbun. 9 มิถุนายน พ.ศ. 2558. สืบค้นเมื่อ 9 มิถุนายน พ.ศ. 2558. ↑ Rugby sevens originally to be held at National Olympic Stadium; venue moved in June 2015. "東京五輪、26競技の会場決定　自転車・サッカー除き". Nihon Keizai Shimbun. 9 มิถุนายน พ.ศ. 2558. สืบค้นเมื่อ 9 มิถุนายน พ.ศ. 2558. 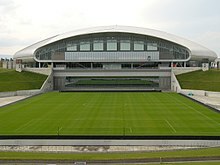 ↑ Originally to be held at Youth Plaza Arena; proposal for venue change to Saitama Super Arena in late 2014 was confirmed in March 2015 by the IOC. "IOC supports Tokyo's plans to relocate Olympic venues". The Japan Times. 19 November 2014. สืบค้นเมื่อ 10 June 2015. "Moving 2020 hoops to Saitama latest blow for game". The Japan Times. 3 มีนาคม พ.ศ. 2558. สืบค้นเมื่อ 10 มิถุนายน พ.ศ. 2558. ↑ Originally to be held at Wakasu Olympic Marina; venue moved in June 2015. "東京五輪、26競技の会場決定　自転車・サッカー除き". Nihon Keizai Shimbun. 9 June 2015. สืบค้นเมื่อ 9 June 2015. ↑ All three events originally to be held at Tokyo Big Sight; venue moved in June 2015. "東京五輪、26競技の会場決定　自転車・サッカー除き". Nihon Keizai Shimbun. 9 มิถุนายน พ.ศ. 2558. สืบค้นเมื่อ 9 มิถุนายน พ.ศ. 2558. ↑ Badminton originally to be held at Youth Plaza Arena; venue moved in June 2015. "東京五輪、26競技の会場決定　自転車・サッカー除き". Nihon Keizai Shimbun. 9 มิถุนายน พ.ศ. 2558. สืบค้นเมื่อ 9 มิถุนายน พ.ศ. 2558. ↑ Wilson, Stephen (10 ธันวาคม พ.ศ. 2558). "IOC approves switch of cycling venues for Tokyo Olympics". japantoday.com. สืบค้นเมื่อ 10 ธันวาคม พ.ศ. 2558. ↑ "IOC approves switch of cycling venues for Tokyo Olympics". japantimes.co.jp. 9 ธันวาคม พ.ศ. 2558. สืบค้นเมื่อ 16 สิงหาคม พ.ศ. 2559. ↑ "Change to Tokyo 2020 equestrian venue approved". inside.fei.org. 28 กุมภาพันธ์ พ.ศ. 2558. สืบค้นเมื่อ 16 สิงหาคม พ.ศ. 2559. ↑ "Tickets for Olympic Games / Tokyo Olympic Japan 2020". ↑ Wilson, Stephen. "IOC Drops Wrestling From 2020 Olympics". ABC News (U.S.). Associated Press. สืบค้นเมื่อ 2 ธันวาคม พ.ศ. 2556. ↑ Staff (14 กุมภาพันธ์ พ.ศ. 2556). "IOC drops wrestling from 2020 Olympics". ESPN. สืบค้นเมื่อ 7 มีนาคม พ.ศ. 2556. ↑ Gallagher, Jack (6 มีนาคม พ.ศ. 2556). "Wrestlers promote Tokyo's 2020 Olympic bid". Yahoo! Sports. สืบค้นเมื่อ 7 มีนาคม พ.ศ. 2556. ↑ Staff (3 มีนาคม พ.ศ. 2556). "Bulgaria's wrestling coach starts hunger strike". USA Today. สืบค้นเมื่อ 7 มีนาคม พ.ศ. 2556. ↑ "Wrestling, baseball/softball and squash shortlisted by IOC for 2020 as five fail to make cut". ↑ "Wrestling added to Olympic programme for 2020 and 2024 Games". IOC. 8 กันยายน พ.ศ. 2556. สืบค้นเมื่อ 8 กันยายน พ.ศ. 2556. ↑ "Olympic Agenda 2020 Recommendations" (PDF). IOC. สืบค้นเมื่อ 23 มิถุนายน พ.ศ. 2558. ↑ "Baseball, softball among 8 sports proposed for 2020 Games". ESPN.com. ↑ "Olympics: Skateboarding & surfing among possible Tokyo 2020 sports". BBC Sport. สืบค้นเมื่อ 29 มีนาคม พ.ศ. 2559. ↑ "IOC approves five new sports for Olympic Games Tokyo 2020". Olympic.org. 3 สิงหาคม พ.ศ. 2559. สืบค้นเมื่อ 3 สิงหาคม พ.ศ. 2559. ↑ "You're in! Baseball/softball, 4 other sports make Tokyo cut". USA TODAY. 3 สิงหาคม พ.ศ. 2559. สืบค้นเมื่อ 18 สิงหาคม พ.ศ. 2559. ↑ "Candidature file for the Tokyo 2020 Summer Olympics" (PDF). p. 8-9. สืบค้นเมื่อ 9 September 2013. ↑ 38.0 38.1 "Tokyo 2020 Emblems Committee relax competition rules ahead of search for new logo". InsideTheGames.biz. สืบค้นเมื่อ 26 ตุลาคม พ.ศ. 2558. ↑ "Checkered pattern by artist Tokolo chosen as logo for 2020 Tokyo Olympics". Japan Times. สืบค้นเมื่อ 25 April 2016. ↑ "เผยโลโก้ใหม่โอลิมปิก "โตเกียว 2020" หลังข่าวอื้อฉาวเรื่องลอกเลียนแบบโลโก้". voathai.com. ↑ 41.0 41.1 41.2 41.3 "Tokyo 2020 Olympics logo scrapped after allegations of plagiarism". The Guardian. สืบค้นเมื่อ 1 กันยายน พ.ศ. 2558. ↑ Fukase, Atsuko (15 เมษายน พ.ศ. 2558). "2020 Tokyo Olympics Attract Record Sponsorship". The Wall Street Journal Japan Real Time. สืบค้นเมื่อ 16 เมษายน พ.ศ. 2558. ↑ "Tokyo 2020 Appoints Asahi Breweries as a Gold Partner of the 2020 Olympic and Paralympic Games". The Tokyo Organising Committee of the Olympic and Paralympic Games. ↑ "ASICS Becomes Tokyo 2020's Tenth Gold Partner". The Tokyo Organising Committee of the Olympic and Paralympic Games. ↑ "Canon announced as Tokyo 2020's latest Gold Partner, official "Still Cameras and Desktop Reprographic Hardware" provider". The Tokyo Organising Committee of the Olympic and Paralympic Games. ↑ "Fujitsu becomes Tokyo 2020 Gold Partner in the "Data Centre Hardware" category". The Tokyo Organising Committee of the Olympic and Paralympic Games. ↑ "Tokyo 2020 Welcomes LIXIL as its Fifteenth Gold Partner". The Tokyo Organising Committee of the Olympic and Paralympic Games. ↑ "Meiji Becomes Tokyo 2020's Fourteenth Gold Partner". The Tokyo Organising Committee of the Olympic and Paralympic Games. ↑ "Mitsui Fudosan Becomes Tokyo 2020's Thirteenth Gold Partner". The Tokyo Organising Committee of the Olympic and Paralympic Games. ↑ 51.0 51.1 "Mizuho and SMFG join Tokyo 2020 Gold Partner Programme". The Tokyo Organising Committee of the Olympic and Paralympic Games. ↑ "Nippon Life Insurance becomes Tokyo 2020 Gold Partner". The Tokyo Organising Committee of the Olympic and Paralympic Games. ↑ "NEC selected as Tokyo 2020 Gold Partner in the categories of "Specialist Public Safety Equipment & Software" and "Network Equipment"". The Tokyo Organising Committee of the Olympic and Paralympic Games. ↑ "Tokyo 2020 Appoints NTT as the First Gold Partner of the 2020 Olympic and Paralympic Games". The Tokyo Organising Committee of the Olympic and Paralympic Games. ↑ "Nomura selected as Tokyo 2020 Gold Partner in the category "Securities"". The Tokyo Organising Committee of the Olympic and Paralympic Games. ↑ "Tokio Marine & Nichido Announced as a Tokyo 2020 Gold Partner". The Tokyo Organising Committee of the Olympic and Paralympic Games. ↑ "Tokyo 2020 Welcomes airweave inc. as an Official Partner". The Tokyo Organising Committee of the Olympic and Paralympic Games. ↑ "Tokyo 2020 Welcomes Ajinomoto Co., Inc. as an Official Partner". The Tokyo Organising Committee of the Olympic and Paralympic Games. ↑ 59.0 59.1 "ANA and JAL Become Tokyo 2020's First Official Partners". The Tokyo Organising Committee of the Olympic and Paralympic Games. ↑ 60.0 60.1 60.2 60.3 60.4 60.5 "Four Leading National Newspapers Become Tokyo 2020 Official Partners". The Tokyo Organising Committee of the Olympic and Paralympic Games. ↑ "Tokyo 2020 Welcomes Cisco Systems G.K. as an Official Partner". The Tokyo Organising Committee of the Olympic and Paralympic Games. ↑ 62.0 62.1 "Tokyo 2020 Welcomes Dai Nippon Printing Co., Ltd. And Toppan Printing Co., Ltd. as Tokyo 2020 Official Partners". The Tokyo Organising Committee of the Olympic and Paralympic Games. ↑ 63.0 63.1 "Tokyo 2020 Welcomes Daiwa House Industry Co., Ltd. as a Tokyo 2020 Official Partner". ↑ "Tokyo 2020 Announces Japan Post Holdings as an Official Partner". The Tokyo Organising Committee of the Olympic and Paralympic Games. ↑ 65.0 65.1 65.2 "Tokyo 2020 Welcomes Three Travel Companies as Official Partners". The Tokyo Organising Committee of the Olympic and Paralympic Games. ↑ 66.0 66.1 "Tokyo 2020 Welcomes Two Railway Companies as Official Partners". The Tokyo Organising Committee of the Olympic and Paralympic Games. ↑ "Tokyo 2020 Welcomes Kikkoman Corporation as an Official Partner". The Tokyo Organising Committee of the Olympic and Paralympic Games. ↑ "Tokyo 2020 Welcomes Mitsubishi Electric as an Official Partner". The Tokyo Organising Committee of the Olympic and Paralympic Games. ↑ "Tokyo 2020 Welcomes SECOM and ALSOK as Official Partners". The Tokyo Organising Committee of the Olympic and Paralympic Games. ↑ "Tokyo 2020 Announces Tokyo Gas as an Official Partner". The Tokyo Organising Committee of the Olympic and Paralympic Games. ↑ "Tokyo 2020 Welcomes TOTO as an Official Partner". The Tokyo Organising Committee of the Olympic and Paralympic Games. ↑ "Yamato Holdings Becomes a Tokyo 2020 Official Partner". The Tokyo Organising Committee of the Olympic and Paralympic Games. ↑ 74.0 74.1 74.2 "Tokyo Olympics 2020: French prosecutors probe '$2m payment'". BBC News. 12 พฤษภาคม พ.ศ. 2559. สืบค้นเมื่อ 14 พฤษภาคม พ.ศ. 2559. ↑ 75.0 75.1 75.2 "Tokyo Olympics: Japan to 'fully cooperate' with suspicious payments inquiry". The Guardian. สืบค้นเมื่อ 7 มิถุนายน พ.ศ. 2559. ↑ "Life bans for three athletics figures over alleged doping cover-up". BBC Sport. สืบค้นเมื่อ 7 มิถุนายน พ.ศ. 2559. ↑ 77.0 77.1 "Tokyo 2020 Olympic bid leader refuses to reveal Black Tidings details". The Guardian. สืบค้นเมื่อ 6 มิถุนายน พ.ศ. 2559. ↑ "IOC concerned at suspect payments made by Tokyo 2020 bid team". The Guardian. สืบค้นเมื่อ 7 มิถุนายน พ.ศ. 2559. ↑ "Tokyo 2020 unveils official emblem with five years to go". Olympic.org. สืบค้นเมื่อ 27 กรกฎาคม พ.ศ. 2558. ↑ "Tokyo Olympic Games logo embroiled in plagiarism row". The Guardian. 30 กรกฎาคม พ.ศ. 2558. สืบค้นเมื่อ 1 สิงหาคม พ.ศ. 2558. ↑ "Tokyo Olympics emblem said to look similar to Belgian theater logo". The Japan Times. 30 กรกฎาคม พ.ศ. 2558. สืบค้นเมื่อ 30 กรกฎาคม พ.ศ. 2558. ↑ 82.0 82.1 "Japan unveils final four candidates for Tokyo 2020 Olympics logo". Japan Times. 8 เมษายน พ.ศ. 2559. สืบค้นเมื่อ 11 เมษายน พ.ศ. 2559. ↑ "Tokyo Games organizers decide to scrap Sano emblem". NHK World. 1 September 2015. สืบค้นเมื่อ 1 กันยายน พ.ศ. 2558. ↑ McCarthy, Michael (7 มิถุนายน พ.ศ. 2554). "NBC wins U.S. TV rights to four Olympic Games through 2020". USA Today. ↑ "Olympics coverage to remain on BBC after Discovery deal". The Guardian. สืบค้นเมื่อ 7 มิถุนายน พ.ศ. 2558. ↑ "IOC awards European broadcast rights to SPORTFIVE". ESPN. 18 กุมภาพันธ์ พ.ศ. 2552. สืบค้นเมื่อ 13 สิงหาคม พ.ศ. 2556. ↑ "Discovery Lands European Olympic Rights Through '24". Sports Business Journal. สืบค้นเมื่อ 1 กรกฎาคม พ.ศ. 2558. ↑ "BBC dealt another blow after losing control of TV rights for Olympics". The Guardian. สืบค้นเมื่อ 30 มิถุนายน พ.ศ. 2558. ↑ 89.0 89.1 "IOC awards SBS broadcast rights for 2018, 2020, 2022 and 2024 Olympic Games". Olympic.org. 4 กรกฎาคม พ.ศ. 2554. สืบค้นเมื่อ 18 สิงหาคม พ.ศ. 2554. ↑ "IOC awards 2018–2020 broadcast rights in Canada". International Olympic Committee. Olympic.org. 28 ตุลาคม พ.ศ. 2557. สืบค้นเมื่อ 29 ตุลาคม พ.ศ. 2557. ↑ "CBC Joins with Bell, Rogers to Deliver 2018, 2020 Olympics". sportscastermagazine. 28 ตุลาคม พ.ศ. 2557. สืบค้นเมื่อ 28 ตุลาคม พ.ศ. 2557. ↑ Furlong, Christopher (20 กรกฎาคม พ.ศ. 2559). "IOC awards 2018–2020 broadcast rights in the Caribbean". International Olympic Committee. Olympic.org. สืบค้นเมื่อ 21 กรกฎาคม พ.ศ. 2559. ↑ Lloyd, Tom (2 มิถุนายน พ.ศ. 2559). "Discovery sign Croatian and Irish Olympic deals". SportsPro. สืบค้นเมื่อ 2 มิถุนายน พ.ศ. 2559. ↑ "IOC awards 2018–2024 broadcast rights in China". International Olympic Committee. Olympic.org. 4 ธันวาคม พ.ศ. 2557. สืบค้นเมื่อ 4 ธันวาคม พ.ศ. 2557. ↑ Morgan, Liam (9 พฤษภาคม พ.ศ. 2559). "Discovery Communications sign broadcast deal with Česká Televize for Pyeongchang 2018 and Tokyo 2020". inside the games. สืบค้นเมื่อ 10 พฤษภาคม พ.ศ. 2559. ↑ "IOC awards 2018–2024 broadcast rights in Japan". International Olympic Committee. Olympic.org. 19 มิถุนายน พ.ศ. 2557. สืบค้นเมื่อ 19 มิถุนายน พ.ศ. 2557. ↑ 98.0 98.1 "IOC awards 2018–2024 broadcast rights in New Zealand and Pacific Island Territories". Olympic.org. 23 มีนาคม พ.ศ. 2559. สืบค้นเมื่อ 23 มีนาคม พ.ศ. 2559. ↑ Emmett, James (21 มีนาคม พ.ศ. 2559). "Dutch broadcaster follows BBC with Discovery Olympic deal". SportsPro. สืบค้นเมื่อ 21 มีนาคม พ.ศ. 2559. ↑ "IOC reaches agreement for broadcast rights in Brazil with Grupo Globo through to 2032". International Olympic Committee. Olympic.org. 10 ธันวาคม พ.ศ. 2558. สืบค้นเมื่อ 10 ธันวาคม พ.ศ. 2558. ↑ Dziadul, Chris (5 ตุลาคม พ.ศ. 2559). "Discovery inks Belarus Olympics deal". Broadband TV News. Broadbandtvnews.com. สืบค้นเมื่อ 5 ตุลาคม พ.ศ. 2559. ↑ "IOC awards TV rights in Germany, Korea, France". USA Today. 5 กรกฎาคม พ.ศ. 2554. สืบค้นเมื่อ 27 มีนาคม พ.ศ. 2555. ↑ Kennedy, Mike (16 มิถุนายน พ.ศ. 2558). "France Télévisions in Canal Plus sub-licensing deal". SportsPro. สืบค้นเมื่อ 17 มิถุนายน พ.ศ. 2558. ↑ Lloyd, Tom (21 เมษายน พ.ศ. 2559). "Finnish broadcaster in Discovery Olympics deal". SportsPro. สืบค้นเมื่อ 22 เมษายน พ.ศ. 2559. ↑ "IOC awards all TV and multiplatform broadcast rights in Europe to Discovery and Eurosport for 2018–2024 Olympic Games". International Olympic Committee. Olympic.org. 29 มิถุนายน พ.ศ. 2558. สืบค้นเมื่อ 29 มิถุนายน พ.ศ. 2558. ↑ 106.0 106.1 Morgan, Liam (30 สิงหาคม พ.ศ. 2559). "Discovery Communications sign two more deals for Pyeongchang 2018 and Tokyo 2020". inside the games. insidethegames.biz. สืบค้นเมื่อ 1 กันยายน พ.ศ. 2559. ↑ "Discovery Communications Inc.: Swiss Viewers to Enjoy Enhanced Olympic Games Coverage Following New Discovery Communications and SRG SSR Agreement". The Wall Street Transcript. twst.com. 6 กรกฎาคม พ.ศ. 2559. สืบค้นเมื่อ 6 กรกฎาคม พ.ศ. 2559. ↑ "IOC awards broadcast rights in United Kingdom for 2014, 2016, 2018 and 2020 Olympic Games to the BBC". Olympic.org. 18 กรกฎาคม พ.ศ. 2555. สืบค้นเมื่อ 18 กรกฎาคม พ.ศ. 2555. ↑ "BBC & Discovery Communications Sign Long-Term Olympic Games Partnership". Discovery Communications. corporate.discovery.com. 3 กุมภาพันธ์ พ.ศ. 2559. สืบค้นเมื่อ 3 กุมภาพันธ์ พ.ศ. 2559. ↑ "IOC awards US broadcast rights for 2014, 2016, 2018 and 2020 Olympic Games to NBCUniversal". Olympic.org. มิถุนายน พ.ศ. 2554. สืบค้นเมื่อ 8 มิถุนายน พ.ศ. 2554. ↑ "Seven Network reclaims rights to broadcast Summer Olympics in Rio de Janeiro in 2016 and Tokyo in 2020". News.com.au. 9 กรกฎาคม พ.ศ. 2557. สืบค้นเมื่อ 9 กรกฎาคม พ.ศ. 2557. ↑ Pavitt, Michael (13 มิถุนายน พ.ศ. 2559). "Austrian broadcaster ORF agree deal for Pyeongchang 2018 and Tokyo 2020". inside the games. สืบค้นเมื่อ 13 มิถุนายน พ.ศ. 2559. ↑ "IOC awards 2018–2024 broadcast rights in Asia". International Olympic Committee. Olympic.org. 29 กรกฎาคม พ.ศ. 2558. สืบค้นเมื่อ 29 กรกฎาคม พ.ศ. 2558. ↑ "RTÉ secures rights for Tokyo 2020 Olympic Games". RTÉ. 2 มิถุนายน พ.ศ. 2559. สืบค้นเมื่อ 2 มิถุนายน พ.ศ. 2559. ↑ "Hungarian Public Television Agrees Deal To Broadcast Summer And Winter Olympics Until 2024". Hungary today. hungarytoday.hu. 20 มิถุนายน พ.ศ. 2559. สืบค้นเมื่อ 20 มิถุนายน พ.ศ. 2559. ↑ "IOC awards 2018–2024 broadcast rights in Middle East and North Africa". International Olympic Committee. Olympic.org. 27 กรกฎาคม พ.ศ. 2558. สืบค้นเมื่อ 27 กรกฎาคม พ.ศ. 2558.